Julian Wash Greenway, Arizona - Walk Ride U.S.A. The Julian Wash Greenway is a 14.4-mile long paved pathway that is located on the south side of the Tucson Metro Area in Southern Arizona. At its northwest end the Julian Wash Greenway connects to the Santa Cruz River Bikeway. From here is heads to the southeast roughly paralleling Interstate 10. The trail goes past a number of local parks and skirts the south side of Davis-Monthan Air Force Base. The southeast end of the trail goes through wide open areas and past the Global Solar Energy Plant with the hundreds of solar collection units. 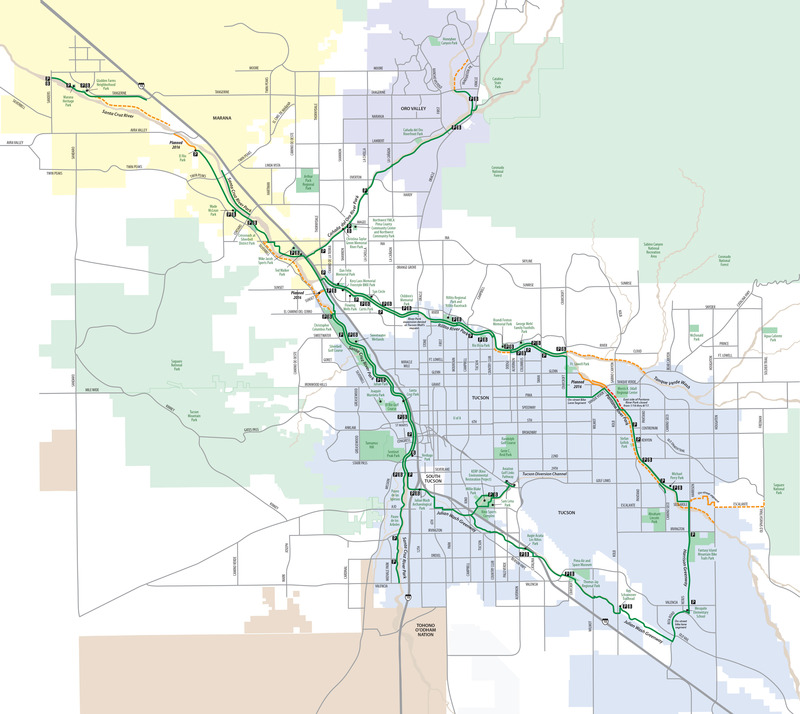 The Julian Wash Greenway is a portion of "The Loop", a system of multi-use paths that when completed will create a continuous loop around the Tucson area. The Julian Wash Greenway is paved for the entire route. The trail is open for bike riding, running and walking. The trail does have a number of street crossings, but much of the route is located away from traffic. The Julian Wash Greenway goes past the following communities: Tucson. Santa Cruz River Bikeway: the two trails meet at the northwest end of the Julian Wash Greenway at a point just south of W. Silverlake Road and west of Interstate 10. Harrison Greenway: this next section of "The Loop" can be reached from the southeast end of the Julian Wash Greeway by travelng along Rita Road for 1.4-miles. The Harrison Greenway heads north for 5 miles and connects to the Pantano Wash Trail. The northwest end of the Julian Wash Greenway is located just south of W. Silverlake Road and west of Interstate 10 in Tucson. There is a trailhead with parking and a restroom at this location. The southeast end of the trail is located along S. Rita Road to the south of E. Old Val Road in Tucson. Following are links to official off-site resources to find out more details about the Julian Wash Greenway in Tucson, Arizona.